Contents: Handel: V'adoro pupille (Giulio Cesare) – Mozart: Porgi, amor (Le Nozze di Figaro) • Dove sono (Le Nozze Figaro) • Deh vieni, non tardar (Le Nozze di Figaro) • Bester Jüngling (Der Schauspieldirektor) • Batti, batti, bel Masetto (Don Giovanni) • Vedrai carino (Don Giovanni) • Ach, ich fühl's (Die Zauberflöte) – Beethoven: O wär' ich schon mit dir vereint (Fidelio) – C.M. von Weber: Kommt ein schlanker Bursch gegangen (Der Freischütz) – Verdi: Caro nome (Rigoletto) • Saper vorreste (Un Ballo in Maschera) • Sul fil d'un soffio etesio (Falstaff) – Gounod: The Jewel Song (Faust) • Ah! Je veux vivre (Roméo et Juliette) – Bizet: Je dis que rien ne m 'épouvante (Carmen) – Offenbach: Elle a fui, la tourterelle! (Les Contes d'Hoffmann) – Massenet: Adieu, notre petite table (Manon) – Leoncavallo: Ballatella (I Pagliacci) – Puccini: Mi chiamano Mimì (La Bohème) • Donde lieta (La Bohème) • Quando men vo (La Bohème) • Un bel dì (Madama Butterfly) • O mio babbino caro (Gianni Schicchi) • Signore, ascolta (Turandot) • Tu che di gel sei cinta (Turandot) – Menotti: The Black Swan (The Medium) • Monica's Waltz (The Medium) – Moore: Willow Song (The Ballad of Baby Doe) • The Silver Aria (The Ballad of Baby Doe) – Mechem: Fair Robin, I love (Tartuffe). Nice collection of arias. Very useful. This book contains familiar arias from familiar operas. The translations and synopses of the songs is very helpful. Piano reductions are comfortable to play. 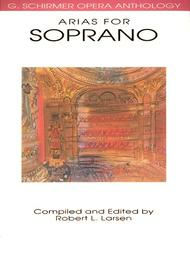 A good resource for singers wishing to expand their operatic repertoire. 32 of 70 people found this review helpful. I like this book. It has many of the favorite opera arias and is suitable to the early intermediate singer on. 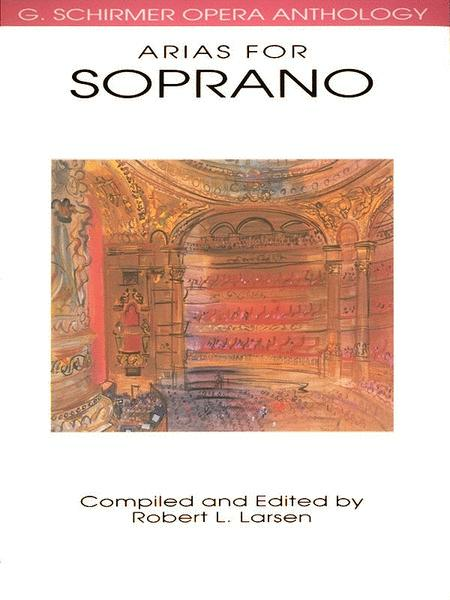 This has a large variety of pieces that are not that difficult and good for the regular lyric soprano. 60 of 124 people found this review helpful. December 22, 2010 great stuff ! 66 of 152 people found this review helpful. I would ( and did buy) both of the Arias for Soprano Volumes. Very handy to have. I don't have to carry a heavy score for one solo. Very comprehensive selection. 66 of 160 people found this review helpful.